Sicilian by birth and Venetian by adoption, Patrizia Laquidara is one of the most elusive, multifaceted and brilliant figures of the new Author music. Singer-songwriter and - occasionally - actress and writer «A poet of maudit extraction » so she has been defined, “a cult figure” among Italian singer-songwriters . Her voice has been described «sometimes sweet and continuous, as well as raging and disruptive, with a stunning power to charm and bewitch». 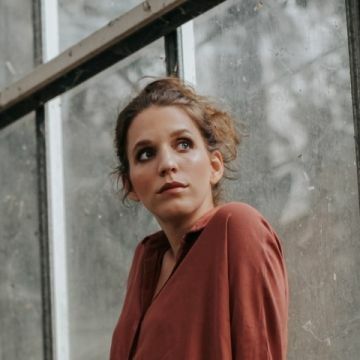 She has produced and co-composed her latest album Il Canto dell’Anguana, which was awarded the TARGA TENCO 2011 for the best Italian album sung in local dialect. Her previous albums are Funambola, produced and arranged by Arto Lindsay and Patrick Dillett (Ponderosa 2006); Indirizzo Portoghese produced by Pasquale Minieri and partly by herself (Rosso di sera 2003); Para você querido Cae, entirely produced by Patrizia for Velut Luna (2000). Before the TARGA TENCO 2011, she received several awards: Critics’ choice at the FESTIVAL DI SANREMO 2003; TROFEO INSOUND 2011 award (best singer); FESTIVAL DI RECANATI 2002 (best singer, best composition, critics’ choice); PREMIO IMAIE 2007 (best “folk music singer”), Giovanni Paisiello award; one of some MAGNA GRECIA AWARDS, and a folk music grant from CET (1999). Already in 2007 her Funambola album won a nomination at the Premio Tenco as one of the best five albums of the year. The song Noite e luar sang by Patrizia and written by herself and Paolo Buonvino is part of the soundtrack to the feature film Manuale d’amore and has been nominated for the David di Donatello award in 2005. She has also acted in the feature film Ritual, una storia psicomagica by Luca Immesi and Giulia Brazzale, starring Ivan Franek, Alejandro Jodorowsky, Cosimo Cinieri, also collaborating to the soundtrack. In the year 2011 rock legend Ian Anderson, of Jethro Tull fame, invited her to share the stage in his winter Italian tour. Besides this, she has a lot of prestigious collaborations in such different fields as jazz, contemporary music and serious pop music (Arto Lindsay, Ben Perowsky, Smokey Horlem, Tom Bartlett, Patrick Dillet, Alfonso Santimone, Rita Marcotulli, Paolo Birro, Fausto Mesolella, Andrea Chimenti, Joe Barbieri, Mario Venuti, Giulio Casale, Tony Canto, Luca Gemma, Kaballà and more) film music (Paolo Buonvino) folk music (Ambrogio Sparagna, Carmen Consoli ,Carlos Nunez, Lautari, Elena Ledda, Mauro Palmas, Ben Mandelson, Nicola Parov, Guo Yue,Rodrigo Leao, Davide Van De Sfross, Stefano Valla, Sandra Kerr, Wu Fei , Lau Ari, and more). Her eccentric talent has brought her in several tours through the U.S. in 2010 (Seattle, New York, San Francisco, Los Angeles) Latin America in 2005, 2010 and 2012 (Quito, Rio de Janeiro, São Paulo, Belo Horizonte, Rio grande do sul, Guayaquil, Quito ecc) Japan 2010 (Tokyo). She also performed in Switzerland, Great Britain, Morocco, Portugal, Spain, France, Belgium, Croatia, always welcomed by a wide and enthusiastic support. Patrizia has also been involved in different perfomance situations. Has sang and acted in two musical comedies, Storia di Milonga and L’Orco, with Antonella Ruggiero, accompanied by the Orchestra del Teatro Olimpico, Vicenza. She is also singer and actress with comedian Natalino Balasso in his Fog Theatre show, with writer Massimo Carlotto in Cristiani di Allah, with poet Enio Sartori in La voce del desiderio. She has performed in Buio Bianco and Morte di un pittore, singing, acting and dancing. She is following the annual theatre workshop at the Studio 83 in Milan. Together with historian Emilio Franzina she has worked on the repertoire of the Italian migration songs, taking part in shows such as Esuli profughi rifugiati, in una parola Migranti, Veneto Transformer. In 2010 has held music workshops at the University of Sao Paulo, Curitiba, Rio de Janeiro, Bento Goncalves, Porto Alegre. In October 2018 he released with her new album "C’è qui qualche cosa che ti riguarda", an independent album also financed by an excellent crowdfunding campaign. The album, anticipated by the two single "Marciapiedi" and "Sopravvissuti" sees the artistic production of Alfonso Santimone.